We’re really excited to announce we’ve just been awarded AHRC follow on funding for our ‘Parlours of Wonder’ project. This new project will enable us to continue the close work with Alive!, Stand + Stare, an app designer and colleagues in care settings to further embed the project outcomes in their practice and in care settings more widely. Community engagement is increasingly recognised by the care sector and social care commissioners as vital in tackling issues of social isolation in our older populations living in care. Together we will be co-designing engaging community spaces (parlours) where older people can interact with evocative objects and the StoryCreator app to record and share their memories and life histories. This will involve imagining and creating a new space of discovery, connection, meaning making and mystery, rather like the ‘cabinets of curiosity’ or ‘wonder rooms’ of old. Unlike cabinets of curiosity, our ‘Parlours of Wonder’ will not be designed and curated by us as arts and humanities researchers, artists and computer scientists. Our vision is that these spaces will be co-curated by and for residents, care staff, families and community members. Care managers who have been involved in the TMP project believe there is huge potential to use these Parlours of Wonder for community engagement where local school children, community groups and isolated older people will be encouraged to enjoy a cup of tea and a chat or a more formal encounter, sparking questions, connections, new interests or opportunities for contemplation. The project builds on and further extends our excellent working relationships with Alive! and Blaise Weston Court (an extra care facility) but will extend our activities to engage new multigenerational audiences, outside of the care settings, with our work. We will also engage with new groups including Hanover (a social housing provider), BrunelCare (a care provider), Britannia Centre (a day care facility) and Deerhurst (a large care home specializing in dementia work) and work closely with policy makers and other influencers (Age UK, Bristol City Council and Bristol Ageing Better) to expand the reach of the work. The development of a new Android version of the app will decrease costs and thereby increase access to the app. To co-design an engaging community focused space in 3 different settings (one existing and 2 new settings – a large care home and a day care centre) where older people and others can interact with evocative objects, sparking questions and new interests and use our StoryCreator app together to record and share their ideas, memories and stories. 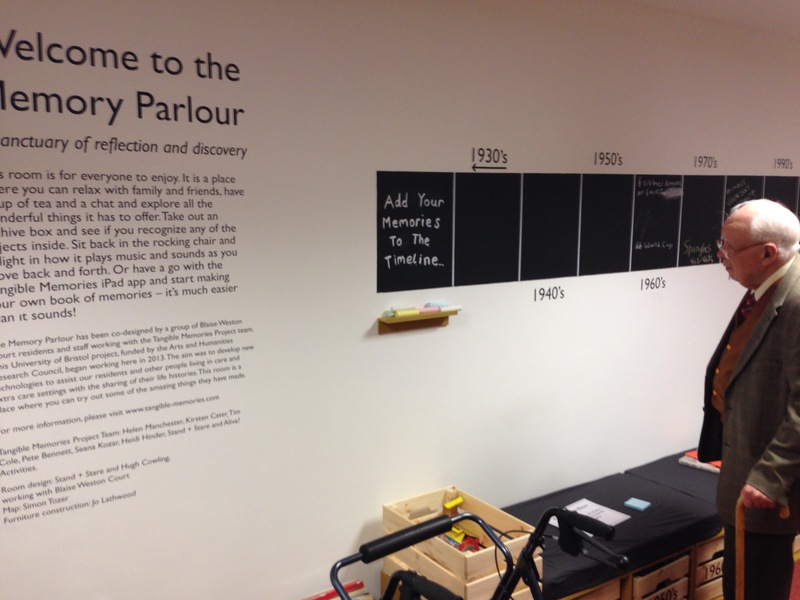 To co-design, with interactive designers Stand + Stare, a DIY blueprint for any care settings to design their own ‘Parlours of Wonder’ and to use our StoryCreator app effectively within them. This will include ideas for engaging older people in co-designing the rooms and interactive case studies with evaluations of the approaches taken across the 3 sites. To work alongside Alive! and care home staff to develop multigenerational community engagement activities in the Parlour settings. To co-design, with Alive!, a training toolkit for care staff to introduce a suite of approaches to engage residents, staff and those in the local community within the Parlours. To include ideas for sustainable staffing models. To further test and develop the iPad StoryCreator app and create a brand new Android version, enabling us to reach new audiences. Both versions of the app will then be made freely available on the relevant app stores. To co-curate an exhibition to officially launch the Parlour idea and the app with Alive! and care settings. To engage policy makers and influencers throughout the project in working together to identify platforms for sharing the value of the work with new local and national care networks.